This is the most recent information about LFO that has been submitted to amIright. 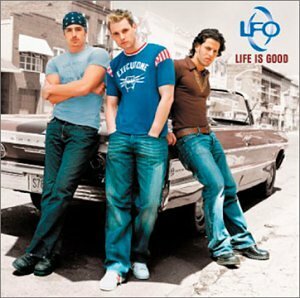 If we have more information about LFO, then we provide a link to the section where it appears (the actual page whenever possible). "Wife Is Good" originally "Life Is Good"
"Life Is Gold" originally "Life Is Good"
At the risk of sounding cheesy. There are additional LFO misheard lyrics available. Whatever I heard, used to think it was "sore" at first. There are additional LFO misheard stories available. I'll steal your honey like I stole your bike. Um, why would you be singing to a girl about having stolen her bike? It's 'funny' that you would actually admit that, Rich! There are additional LFO Funny lyrics available. and you told everyone that I was gay. I guess it goes with the theme of loving this girl 'every other time,' but this song is just so dumb and this lines adds to its stupidity. I don't think the girl was too far off anyway. What do the New Kids on the Block have to do with girls coming for the summer... and where does the Chinese food come in? This song is total nonsense to me. There are additional LFO nonsensical lyrics available. There are additional LFO misrhymed lyrics available. *ahem* no they didnt have a lot of hits and erm...what has not liking chinese food got to do with summer girls? in fact what does any of the lyrics have to do with gurls?? What does 'shooby doo-wap' and 'scooby snacks' have to do with a girl that all 3 of these guys like who is a movie star? I think they could've found a better rhyme for that one.. There are additional LFO inappropriate lyrics available. Michael J. Fox was Alex P. Keaton. There are additional LFO celebrity lyrics available. There are additional LFO product lyrics available. The actual phrase "summer girls" is only heard once in the song, most of the time it's as above or stated "summertime girls". "Every Other Tim E." originally "Every Other Time"